Norwegian Foreign Minister Børge Brende now condemns the civilian loss of life in Gaza and has toughened his rhetoric against both the Israelis and the Palestinians. On behalf of the Norwegian government, which has long been directly involved in efforts to broker peace in the Middle East, Brende is demanding that both sides agree on and maintain a ceasefire immediately. The Norwegian Foreign Ministry noted that the fighting has now lasted for three weeks and the killing and destruction isn’t serving any purpose. “The crisis cannot be resolved, nor the conflict won, by military means,” Brende said in a statement released by the ministry. “Israel will not achieve peace and security by continuing its ground offensive. Nor will the firing of more rockets from Gaza into Israel give the Palestinians in Gaza a better life or dignity. Israel’s attack on a UN school in Gaza that was trying to shelter Palestinians reportedly killed at least another 20 refugees during the night. More than 1,200 Palestinians, an estimated 240 of them children according to UNICEF, have now been killed in the past 22 days. Around 50 Israelis have been killed, most of them soldiers. 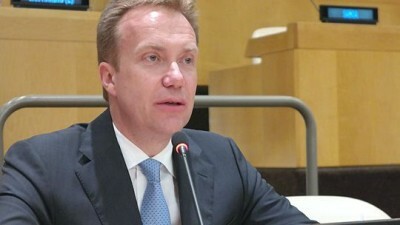 Opposition politicians in Norway have criticized Brende for not directly condemning Israel for its military aggression and for its refusal to end its occupation of Palestinian territory, which many see as the root of the problem. Calls have gone out to impose boycotts of Israeli goods, especially those produced in occupied areas, and to expel Israel’s acting ambassador in Norway. Norman Finkelstein, born in an American Jewish family who survived the Holocaust, has nonetheless long criticized Israel himself and told Oslo newspaper Dagsavisen on Wednesday that Israel must do as Germany ultimately did at the end of World War II when it gave up its occupation of Norway and other countries – pack up and leave. Israel, meanwhile, insists on the need to defend itself from Palestinian rockets fired by the Palestinian organization Hamas and refuses to negotiate with Hamas, claiming it is a terrorist organization.